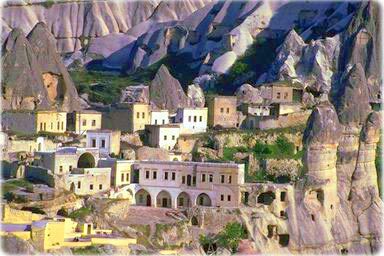 Country name: Republic of Turkey (local: Turkiye Cumhuriyeti). Government type: republican parliamentary democracy. Independence: 29 October 1923 (successor state to the Ottoman Empire). Administrative divisions: 81 provinces (iller, singular - il); Adana, Adiyaman, Afyon, Agri, Aksaray, Amasya, Ankara, Antalya, Ardahan, Artvin, Aydin, Balikesir, Bartin, Batman, Bayburt, Bilecik, Bingol, Bitlis, Bolu, Burdur, Bursa, Canakkale, Cankiri, Corum, Denizli, Diyarbakir, Duzce, Edirne, Elazig, Erzincan, Erzurum, Eskisehir, Gaziantep, Giresun, Gumushane, Hakkari, Hatay, Igdir, Isparta, Istanbul, Izmir, Kahramanmaras, Karabuk, Karaman, Kars, Kastamonu, Kayseri, Kilis, Kirikkale, Kirklareli, Kirsehir, Kocaeli, Konya, Kutahya, Malatya, Manisa, Mardin, Mersin, Mugla, Mus, Nevsehir, Nigde, Ordu, Osmaniye, Rize, Sakarya, Samsun, Sanliurfa, Siirt, Sinop, Sirnak, Sivas, Tekirdag, Tokat, Trabzon, Tunceli, Usak, Van, Yalova, Yozgat, Zonguldak. Terrain: high central plateau (Anatolia); narrow coastal plain; several mountain ranges. Highest point: Mount Ararat 5,166 m (the legendary landing place of Noah's Ark, is in the far eastern portion of the country). Climate: temperate; hot, dry summers with mild, wet winters; harsher in interior. Ports and harbors: Gemlik, Hopa, Iskenderun, Istanbul, Izmir, Kocaeli (Izmit), Icel (Mersin), Samsun, Trabzon. Note: strategic location controlling the Turkish Straits (Bosporus, Sea of Marmara, Dardanelles) that link Black and Aegean Seas. Copyright © Geographic Guide - European Countries, Travel. 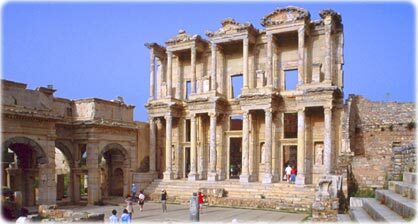 Ruins of the Library of Celsus, Ephesus, Anatolia. Present-day Turkey was created in 1923 from the Turkish remnants of the Ottoman Empire. Soon thereafter, the country instituted secular laws to replace traditional religious fiats. In 1945 Turkey joined the UN. Hagia Sophia in Istanbul, once the world's largest Byzantine church. 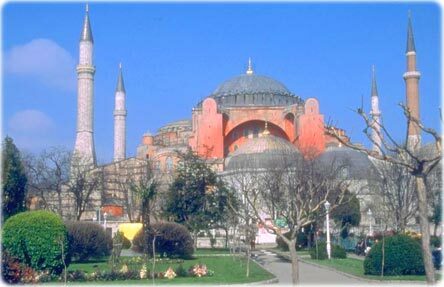 Built between 532 and 537 as the Cathedral of Constantinople by the Emperor Justinian. Since 1935 it is a museum.